Building toy kit help your boys and girls acquire strong sense of color, different shape; Practice hand-eye coordination, stimulating young, arouse curious minds while playing, best educational toy for your children! Suitable for indoor, outdoor, traveling, summer toy in swimming pool, kindergarten, etc. Your babies can even use the infant building blocks as bath toys. This bristle building set can stick together at any angle, easy to build and easy to disassemble. Maximize fun and creating more constructions, never waste time or ruin the mood. 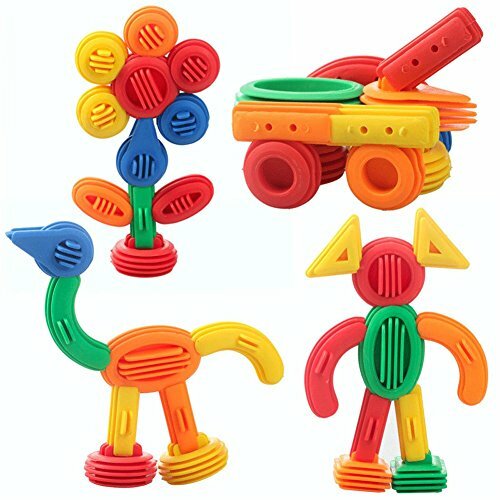 EASY Assemble&Intellectual Development Various games to play,it can develop hand-eye coordination,logical thinking,creativity,color and shape recognition,spatial imagination ability,patient and problem-solving skills.